If you’re trying to find over 55 communities in Central Florida that are pet friendly and still offer resort-style retirement living, Bear Creek is the community for you. We are situated in wooded tranquility in Ormond Beach, just a short drive from the state’s beautiful Atlantic Beaches and a host of other attractions. 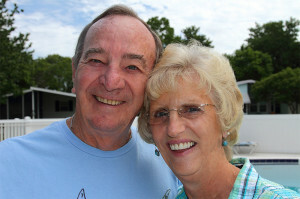 Our location is often reason enough for retirees to choose us as their retirement community. Having a pet can help reduce blood pressure, and even can help alleviate depression. Pets that need exercise, like dogs, keep their owners active and healthier. Studies show that people with pets tend to interact more with their neighbors, improving the friendliness of the community as a whole. But being a pet-friendly community isn’t the only reason to choose Bear Creek. We offer an astounding array of amenities, starting with our three distinct clubhouses, each of which has a pool and spa. Our community has courts for playing pickleball, shuffleboard, tennis, horseshoes, and other games, and daily activities that cater to a wide array of interests. Outside of our gates, residents have immediate access to the white-sand beaches of Florida’s Atlantic Coast, as well as the attractions in nearby Daytona. Kennedy Space Center and the theme parks in the Orlando area are just a short drive away. For more information on what sets Bear Creek apart from other over 55 communities in Central FL, contact one of our friendly Lifestyle Consultants today.